Business owners in Shropshire will be able to get free support and advice to help their companies grow in a series of free roadshows across the county. The Shropshire Growth Roadshow will head to Oswestry, Ludlow, Bridgnorth and Shrewsbury later this year to deliver free three-hour workshops for established business owners to signpost them to the national and local business support and funding that is available. The Shropshire Growth Roadshow is being delivered on behalf of The Marches Growth Hub Shropshire by business coaching and mentoring experts Good2Great. All roadshows start at 9.30am and finish at 12.30pm. 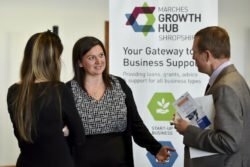 Amy Farley, from the Marches Growth Hub Shropshire, said: “It can be difficult for small business owners to step away from the workplace and find the time to explore the opportunities and support that is relevant to them. “There is a wide range of funding and support available for Shropshire SMEs to aid business growth and these free roadshows will offer them tailored and succinct advice right on their doorstep. To reserve a free place, register at www.businessgrowthroadshow.co.uk.